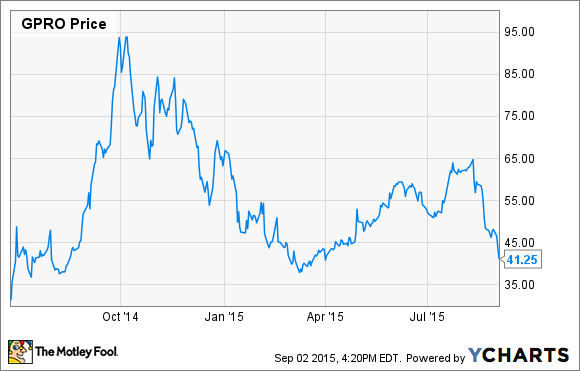 GoPro Tumbles Again: Should Investors Be Worried? GoPro stock has now given up all of its gains of the past five months, but the outlook may not be as bad as investors seem to think. On Wednesday, shares of action camera market leader GoPro (NASDAQ:GPRO) plummeted again, following weak guidance from its chip supplier Ambarella (NASDAQ:AMBA). GoPro stock has been on a wild ride since its IPO last June. After going public at $24/share, the stock quickly doubled and peaked just below $100 in early October, around the time that GoPro launched its top-of-the-line HERO4 Black and HERO4 Silver cameras. The stock then plummeted below $40 by March before rebounding to $65 on the back of two blowout quarters. Its renewed slump took GoPro stock back below $40 on Wednesday morning, though it recovered to $41.25 by the end of the day. While Ambarella's forecast is a noteworthy indicator of wearable camera market trends, investors appear to be reading too much into this single data point. GoPro is far from exhausting its growth opportunity, and its stock looks quite cheap compared to most companies with similar growth prospects. During Ambarella's Q2 earnings call on Tuesday, CFO George Laplante stated that Ambarella's revenue from wearable camera products would decline both sequentially and year over year in Q3. He attributed the muted performance to the timing of key product launches from GoPro, as well as other wearable camera makers. During Ambarella's fiscal second quarter, GoPro launched its new HERO+ LCD mid-range action camera and HERO4 Session ultra-compact camera. This wasn't really news, though. A quarter earlier, Laplante had forecast that Ambarella would deliver strong growth in Q2 due to product launches moving earlier in the year, which would have a corresponding negative impact on revenue in the second half of the year. Laplante's comments this week simply indicated that Ambarella's outlook has not changed significantly. Nevertheless, several analysts have cut their estimates for GoPro this week, driven in large part by Ambarella's comments on the wearable camera market. GoPro investors certainly shouldn't ignore Ambarella's forecast. Since Ambarella's fiscal calendar is one month behind that of GoPro and GoPro must order components in advance of selling its products, Ambarella should have good insight into order trends from GoPro. On the other hand, Ambarella and GoPro both have a tendency to underpromise and then beat their forecasts. So Ambarella's most recent guidance may exaggerate the expected slowdown in the action camera market. Additionally, GoPro has no reason to lock itself into aggressive growth targets by committing to chip orders far in advance. If demand for its devices remains strong in the next few months, GoPro can probably order chips as late as October or even November to meet holiday-season demand. Thus, Ambarella's guidance may be based on a conservative demand forecast from GoPro. Furthermore, it appears that GoPro won't be updating its top-of-the-line HERO4 Black and HERO4 Silver cameras this fall. While that will lead to slower growth next quarter, it also sets up a likely acceleration in sales growth for 2016, when GoPro will probably update its high-end devices. Lastly, GoPro plans to introduce a quadcopter drone next year. This will represent its entry into a rapidly growing market. Ambarella stated that chips for "flying cameras" surpassed 10% of total company sales for the first time last quarter, and it expects this growth to continue in Q3. The bottom line is that Ambarella's forecast for a decline in revenue from action camera chips in Q3 doesn't necessarily mean that GoPro will have a weak holiday quarter. And even if GoPro faces a significant slowdown this fall, its sales growth is likely to reaccelerate next year after it launches its quadcopter drone and next-generation high-end action cameras. GoPro stock now trades for less than 20 times forward earnings estimates, which is surprisingly low for a company with big growth prospects. There's definitely plenty of risk in the fast-moving action camera market, but with GoPro stock having fallen more than 35% since last month, that risk is far outweighed by the potential rewards.